Generate and print various types of ID cards including student ID cards, employee ID cards, security ID cards, visitors ID cards etc. 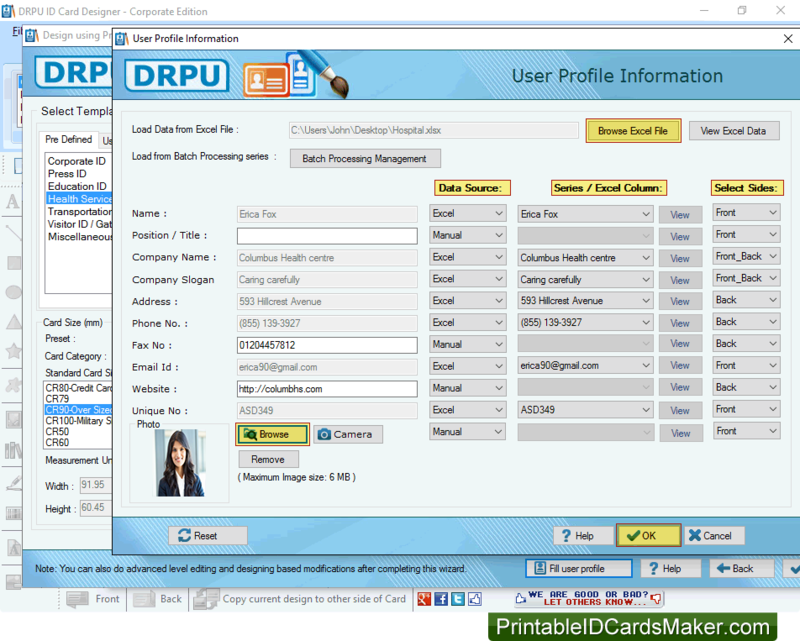 ID Cards Maker (Corporate Edition) is useful to create ID cards with option to print using print-settings. Software has feature to save or export designed id cards as template, as PDF file format and as image (JPEG, PNG and other File formats). Software provides specialist mode to design Gate Pass ID cards for visitors. You can also manage the database of entire visitors records for future reference. ID Card Maker Tool provides feature to create single (Front) or two (Front and Back) sided id cards. To add photo on id cards you can capture image using camera option in software as well as you can crop image for id cards if required. ID Cards Designer Program provides advanced email-settings to send created ID cards at specified email IDs. ◈ Software has various pre-defined ID Card Design samples (pre-loaded templates) to quickly create id cards. ◈ Using Live Group and Batch Processing Mode you can design id cards for group of people using excel data. ◈ ID Cards Maker (Corporate Edition) allows user to design and print ID cards in different shapes such as rectangle, ellipse and rounded rectangle. ◈ Software has various card designing objects such as text, line, ellipse, rectangle, triangle, star, symbols, image library, browse image, barcode, watermark, signature and card background. ◈ If you are designing visitor id card you can add visitors details to the database. ◈ ID Cards Maker Software uses advanced data set series generating method to create multiple numbers of identity cards with different text and barcode value. 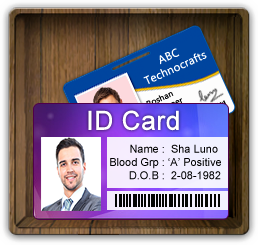 ◈ ID card creator software provides facility to modify created identity card according to user requirements. ◈ Program has option to copy current card design to the other side of card. ◈ Identity card maker program has inbuilt color and background settings to create colorful customized ID cards.